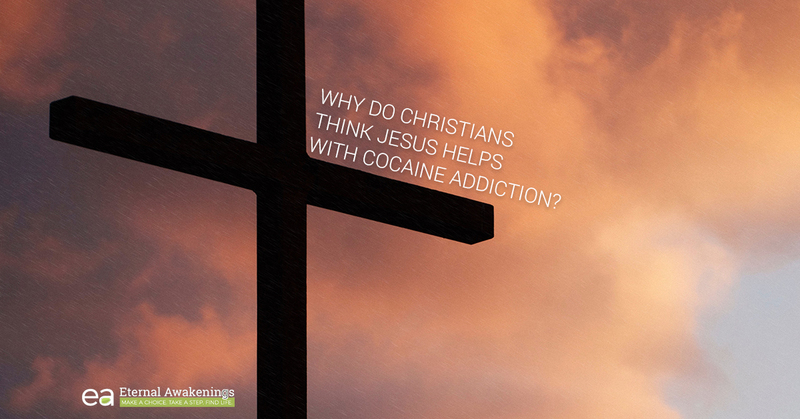 Cocaine Addiction Help: Why Do Christians Think Jesus Makes a Difference? Why Do Christians Think Jesus Helps With Cocaine Addiction? Eternal Awakenings is a Christian-based drug and alcohol rehab center in Texas, and we have a long-standing track record of helping people to recover permanently from their addiction. While you definitely don’t have to be a Christian in order to attend our residential rehabilitation program, we do believe that the Christian faith plays an intrinsic part in helping our clients to find freedom from addiction to drugs or alcohol. We don’t blame you at all for thinking this way. After all, the Christian faith includes some downright counter-intuitive things. But let’s establish right off the bat what we don’t mean when we claim that faith in Jesus will make a difference in your recovery. We don’t believe that church attendance, rituals, chants, or jumping through religious hoops is the key to being free from addiction. While our residents will attend church at Living Waters Fellowship during their time in our program, this is not to earn merit with God or check off a task list. Instead, it is to assemble together with other believers, hear the word of God, and worship him because we love him. If nothing else, you can look at church attendance as just another type of counseling session, but we’re confident that you’ll also come to enjoy and appreciate the church service as beneficial to you. We don’t believe that if people would just “become a little more religious” or “add a little religion to their lives,” they would be better able to conquer addiction. It’s not about working up a mystical state of mind, it’s about getting to know a person, Jesus. We also definitely don’t intend for anyone to check their brain at the door in order to “have faith” or feel like they’re believing a myth. In fact, we encourage you not to do that. Either Christianity is robust enough to withstand scrutiny or it is not worth following. So we encourage you to ask questions, make objections, and probe the claims of Christianity as deeply as you’d like. Instead, the Christian faith is about believing in and loving Jesus, and he is the one we believe can make a difference, not only in addiction recovery, but also in every area of life. So let’s say you have a cocaine addiction (though these principles can apply to any kind of addiction). How does Jesus help? What difference does it make to know Jesus? Here are a few of the ways we would invite you to consider. Jesus is God. God is all-powerful. If God helps you with your addiction, you can be free. Christians believe that Jesus is more than just a historical figure who walked the earth two thousand years ago. We believe that Jesus is God, and that he ascended to heaven 40 days after he rose from the dead, where he is still alive today. Jesus is not just a remote figure who stays detached from the affairs of this world. He cares about you, here, right now, and he offers to help you. When you have his help, you are not limited to mere earthly methods to conquer your addiction. You also have a resource that gives you access to supernatural power. Why would you do without that if it was available to you? Jesus died to break the power of sin. Addiction has met its match. Most people know that Jesus died to pay for our sin, but fewer people realize that his death accomplished something else, too: he opened the way for sin’s power to be defeated. The Bible teaches that when Jesus went to the cross, in a spiritual sense, he took the believer to the cross with him. We were crucified with Christ. Our flesh, the power within us that wants to do wrong, was legally severed from having power over us through this death. What do you do when your flesh wants to use but your spirit wants to stay sober? If you don’t have Jesus, your flesh wins when it wants its way. When you have Jesus, the flesh is no longer your dictator; you have another alternative open to you. Jesus rose from the dead. The same power that raised Jesus from the dead is available to dwell in you. How much power does it take to raise a dead guy? A lot. And if you have that power available to you, do you have what you need to conquer your addiction? Absolutely. To the believer, Jesus offers to not only give us “power,” but to give us his Spirit, the Holy Spirit, to dwell inside us. If the spirit that allowed Jesus to live a sinless life lives in you, can you do things differently than you used to? Absolutely. If the spirit that raised Jesus from the dead lives in you, can you live a whole new life? You sure can. This is a magnificent promise to the children of God. Jesus heals. The pain, trauma, and stress that causes you to turn to addiction is healed better in Jesus. Addiction doesn’t exist in a vacuum. When you are hurting the most, that’s when you want to use the most. Life isn’t always kind. It throws pain, sadness, loss, grief, and hurtful circumstances our way, and it doesn’t distribute them fairly. When you have gone through soul-crushing sorrow, you just want something to numb the pain. But what if that pain could be healed and comforted with peace that passes understanding? In Jesus, this is possible. Jesus knows the deepest wounds of our hearts, and he is able to visit those areas with a gentle, healing touch. Jesus loves you. Cocaine robs from you. It helps to switch loyalties to the one who has your best interest in mind. It is an unfathomable mystery that the God who created the universe would notice us, much less love us, but it’s true. Cocaine holds out a promise that it will give you what you are searching for and fulfill your deepest longings, but it turns out to be a fraudulent promise. Jesus promises to love you, and he is faithful to his word. When you love someone, you follow them. When you follow Jesus, there’s just something about it: life works. His promise is not hollow or empty. Make him your first loyalty, and you’ll find that you have a whole new level of victory over addiction. Jesus is better than the highest high. When you have tasted him, you don’t want anything else. You already have the best thing in the universe. With cocaine or any other drug, you need more of it to get the same high that you got the first time, so you’re always chasing the dragon, pursuing that ecstasy, that incomparable, superhuman feeling, that euphoria that you wish could last forever. This may sound like an exaggeration, but when you fall in love with Jesus, or more precisely, when he reveals himself to you, you’ll find that he is better than the best high that you ever experienced. Plus, you can have as much as you want of Jesus, he will never go away or stop being satisfying, and the more you discover about him, the more you love him. We’re not surprised if this sounds like an outrageous claim or something that can’t possibly be true, but it has proven to be true for many addicts, and it can be for you, too. When you have tasted this, it goes a long way toward establishing permanent recovery. You’re way less likely to go back to something that looks hollow and useless by comparison. Come to Eternal Awakenings to learn more about how to walk with Jesus and leave behind your cocaine addiction. When you attend our drug rehab program, we’ll not only give you substance abuse counseling, we’ll introduce you to Jesus Christ in a way that we hope will change your life for the better—permanently. (Whether or not you ever come to Eternal Awakenings, you can read the message of the gospel of Jesus Christ in the Bible, in the books of Matthew, Mark, Luke, and John in the New Testament. May you find freedom, joy, and salvation through that study.) Please contact us to start the enrollment process in our program today.